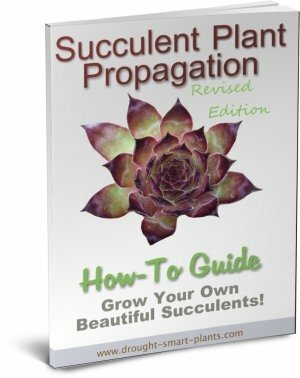 Learn how to prune succulents the right way - it's not that hard, honestly. 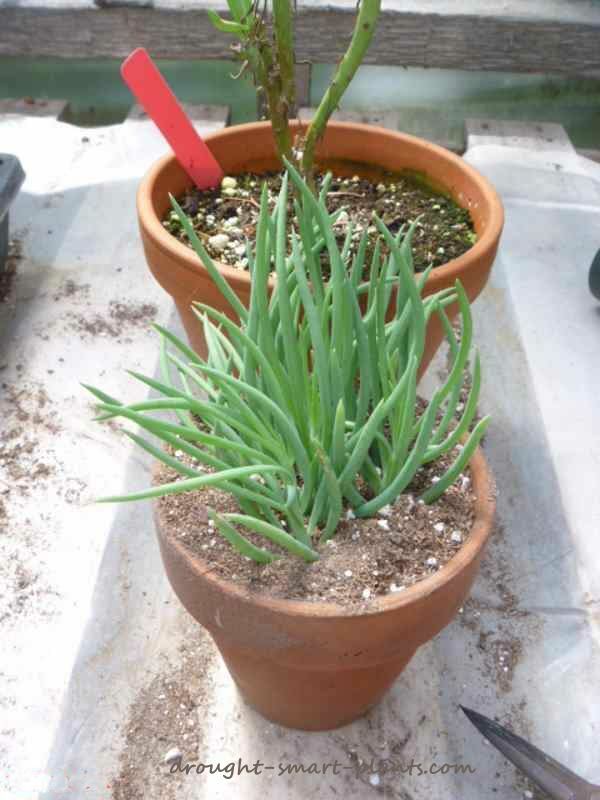 The number of times people ask me how to work up the nerve to cut that bedraggled, scraggly overgrown thing in their succulent plant collection, and I'm brutal - just chop off its head! So, you've worked up the courage to take the scissors to your poor plant. 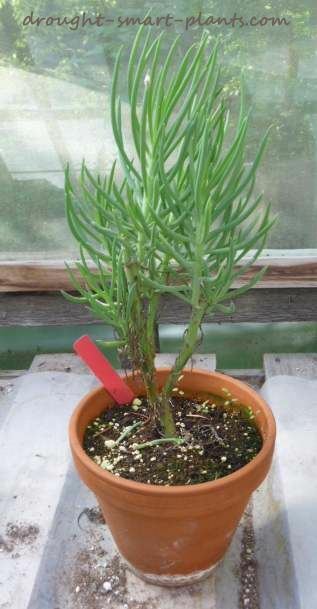 First of all, take a good look at it in bright light, and see where you might be able to cut it off so that the cut is, first of all, above an outward facing leaf. As all leaves protect a bud where new growth will emerge, this will create a cup shaped plant, ideal for giving each new branch some space. This is a fundamental rule in every type of pruning, whether it's an apple tree or a bonsai pine. You wouldn't recognize this as the same plant that I pretty much neglected all winter under lights in a back bedroom. It was totally dried out, and dessicated, and I actually wondered for a moment or two if I had killed it finally. But no, it recovered after being outside in a semi shaded spot behind the house and getting some of the most beneficial natural treatment, rain fall. I call this 'putting it on neglect' and it's amazing how well it works for succulents. Not fretting about killing off your plants does wonders for your stress level too! As you may be able to see, some of the newest growth is actually thicker than the older growth. This shows that it's really happy, and it's a good time to prune it. 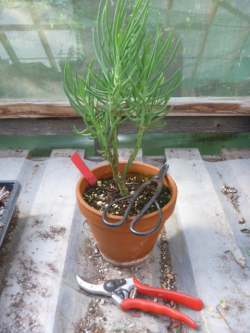 Pruning plants that are in distress sometimes puts them over the edge and they'll decline until they die. Pruning a healthy, happy plant will only encourage it to bush out and grow some more, all things being equal, and some fertilizer is applied just after the appearance of new growth, and it is in bright enough light. Other rules about pruning are to always remove dead, diseased or crossing growth, and to make sure each branch will have a bit of room around it. In pruning apple trees, the advice is to make sure that a bird can fly between the branches, however, that's not really applicable with succulents - a moth, maybe? I also take the opportunity to check for bugs, remove any dead or shriveled leaves, and maybe add some lava rock mulch to cover the soil. Prettying it up can be just like you getting a haircut and a manicure - it changes your whole outlook. There, that wasn't so difficult, now was it? 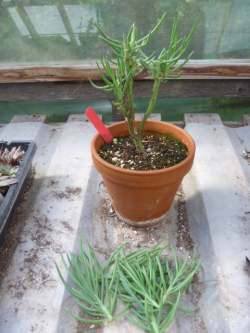 Now I've got five or six new cuttings, which once they've calloused, will grow into lovely, lush new plants. 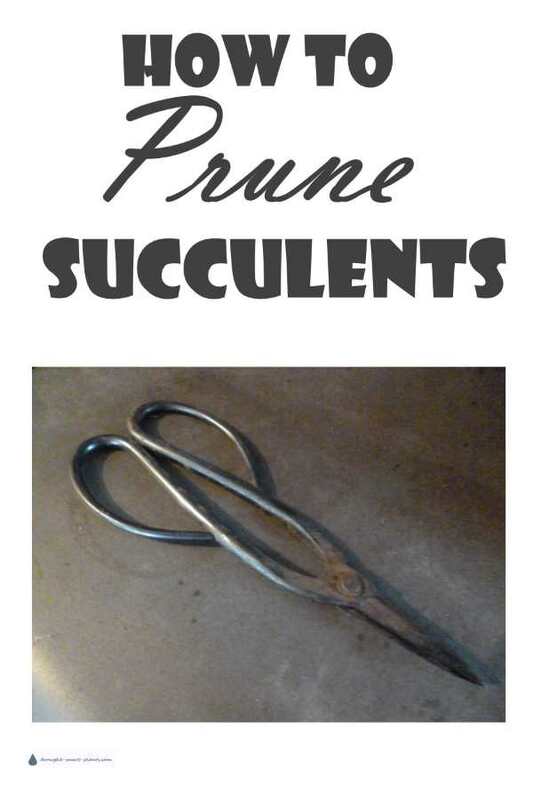 That's the added bonus to pruning succulents. The aim of all this is to make the original plant more compact, healthier and with lots more new growth aimed outwards from the center. I think a lot of times people are intimidated by pruning but really, the only way to learn how to do it is to do it. Learning from seeing me do it won't wrap your brain around the understanding of it, so get out there and prune a succulent plant or two; you'll see what I mean. Observe what happens when you cut a certain part off. See where the growth emerges, and soon you'll be able to anticipate what the plant will look like after it starts to grow in again. What Do I Do With My Succulent Flower Stalk?